Venezuelans marched in dueling protests Saturday, with the two men who claim to be the divided nation’s president each exhorting followers to hold firm and that victory was certain. But only one man will prevail, and the unusual split-screen rallies offered no decisive hints, just more proof that Venezuela’s crisis is digging ever deeper and that the nation’s powerful military remains a key to the solution. The authoritarian president Nicolas Maduro attracted a larger crowd than expected, a show of force apparently aimed at suggesting he retains wide support. 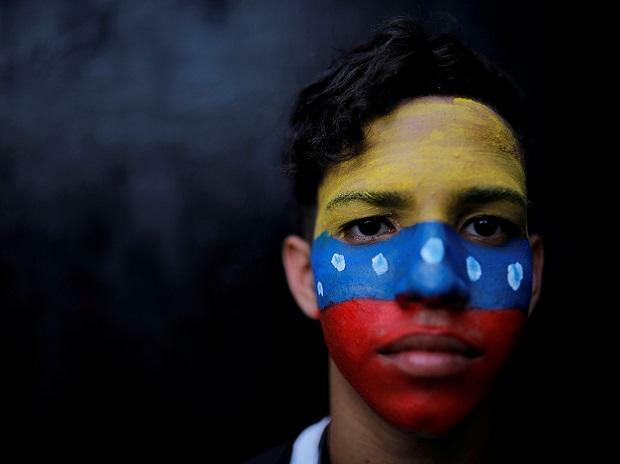 “I have absolute certainty that change is very near in Venezuela,” a hoarse Juan Guaido, the 35-year-old legislator whom the National Assembly named interim president on Jan. 23, told thousands of supporters on the streets of Caracas. He also has won the support of much of the outside world, including the US. He was referring to the dozens of nations that have demanded that he hold new elections. On Saturday, Spain, the U.K. and Germany raised the pressure in a draft communique pushing the European Union to also recognize Guaido. A copy was obtained by Bloomberg. It was difficult to tell whose march was bigger, but there were differences: Maduro’s felt more choreographed, ringed with buses that had carted in people and militias. Guaido’s protest, called for several days ago, had an air of spontaneity as Caracans streamed by foot from barrios to the prosperous area where the protest was held. Maduro has ignored the demands for presidential elections but in his speech defiantly suggested instead that the National Assembly, which chose Guaido, call early elections. Guaido, who says he has reached out to factions in the military, was quick to point out the defection. In his speech, Guaido announced that an international coalition would be bringing humanitarian aid through two points on Venezuela’s borders with Brazil, Colombia and also from an undisclosed Caribbean island. He promised to give more details soon, as he urged the military to help and to refrain from violence. “You, soldier, are responsible for the humanitarian aid arriving,” Guaido told his sea of supporters. Saturday marked the 20th anniversary of what’s known as Chavismo, to which the 56-year-old Maduro is the heir. Hugo Chavez, a leftist army colonel, was first elected president in 1998 after having been imprisoned for leading a failed coup in 1992. Angel Tovar, 61, a supermarket manager, came with dozens of motorcyclists in a caravan to show their support for Maduro. The crowd dressed in red uniforms and berets to reflect their allegiance to the socialist government. Guaido supporters said it was time for change, an end to the greatest economic collapse in the nation’s history. “We’re here for Venezuela’s freedom and our children’s well-being,” said Maribel Rondon, 64, holding a Venezuelan flag as she marched with two friends. “We’re going through a lot of hardship in Venezuela because of Maduro. He needs to go." The protest was another test of endurance of support for Guaido. 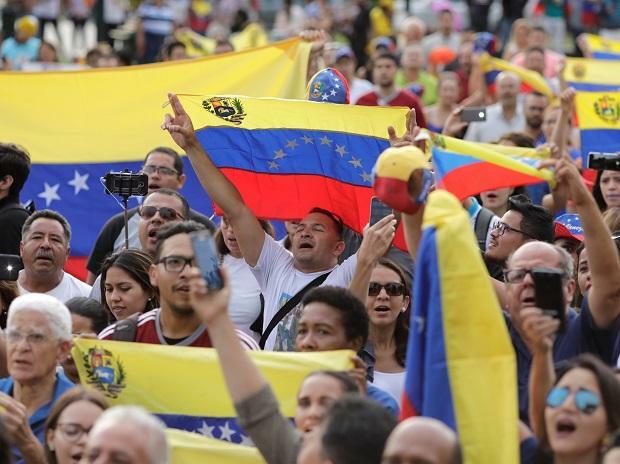 Though Maduro has prevented Guaido from leaving the country, he has left him free to make pronouncements, speak with foreign leaders and hold daytime rallies. At the same time, Maduro has sought to tamp them down through information blackouts, intimidation and violence. On Jan. 26, the EU called on Maduro to move “over the next days” toward elections and dangled the prospect of recognizing Guaido as interim president in the absence of any announcement on a new ballot. However, the unpopular leader has refused to back down even as western leaders threaten further economic punishment on a nation already grappling with hunger and hyperinflation. The US froze assets and levied sanctions on crude, the pillar of the Venezuelan economy, on Monday, promising to hand revenue to the Guaido government. Millions of Venezuelans struggle with spiraling prices and empty store shelves, but the ruling socialists have largely refused international aid. Guaido and his allies say they will convene more demonstrations in the coming days to demand that shipments be allowed to enter the country. “This is situation has to stop," said anti-Maduro protester Jairo Vargas, 47, an out-of-work veterinarian. “Our kids are skinny because we’re skipping meals and when we do eat it’s not the right food — pasta and beans, then rice and beans. The world needs to hear us. We want change."